Has Star Wars just got real? 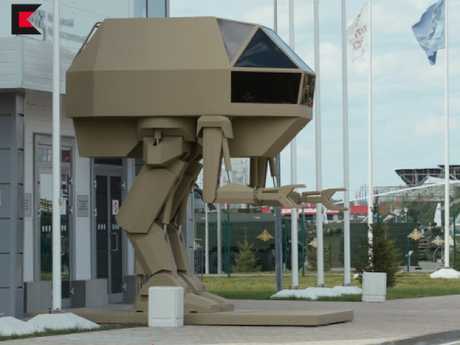 The AT-ST Scout armoured walking vehicle from thefranchise appears to have inspired Russian arms developers. RUSSIA is holding a defence expo in Moscow to hawk its latest military wares. And guarding the entrance is something straight out of science fiction: a battle mech. We've seen them in Star Wars, and Avatar. And the popular Battletech game franchise is entirely built around the concept of walking armoured and armed machines. It seems Moscow was impressed. One of its leading arms manufacturers, Kalashnikov - world-renown for its rugged assault rifles - says it is attempting to turn the concept into reality. 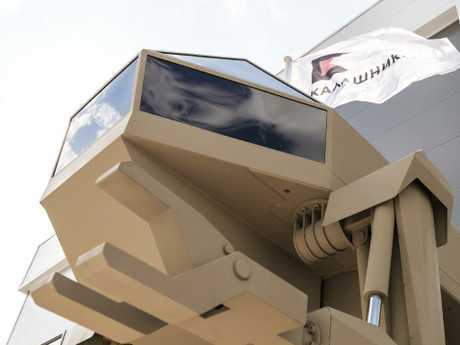 According to pro-Moscow media outlet Russia Today, Kalashnikov is showing off a 4m tall mechanised walker at the Army-2018 international forum. Kalashnikov's concept walking 'battlefield engineer and fighting vehicle' at an arms expo near Moscow. Picture: Kalashnikov. So far, it's just a testbed for the technologies involved. It's called a "controlled bipedal walker". Its mission is simply described as "engineering and combat solutions". RT reports the project is in its early stages, but a more advanced model is already in the works and will be displayed at next year's expo. 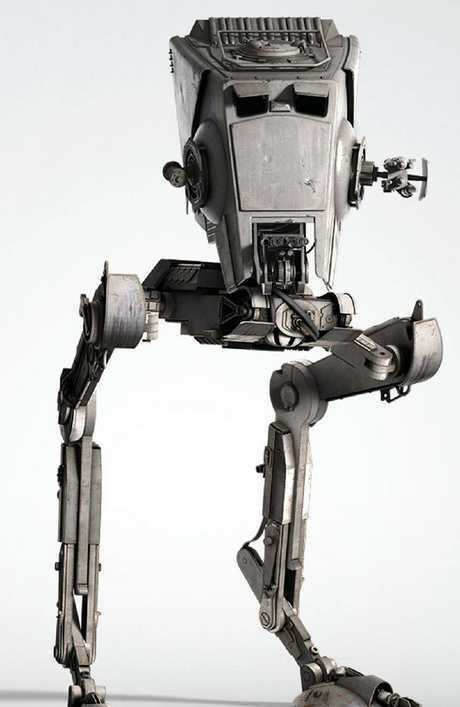 A promotional image of the Star Wars AT-ST Scout which appears in the movies Return of the Jedi, Empire Strikes Back and Solo. 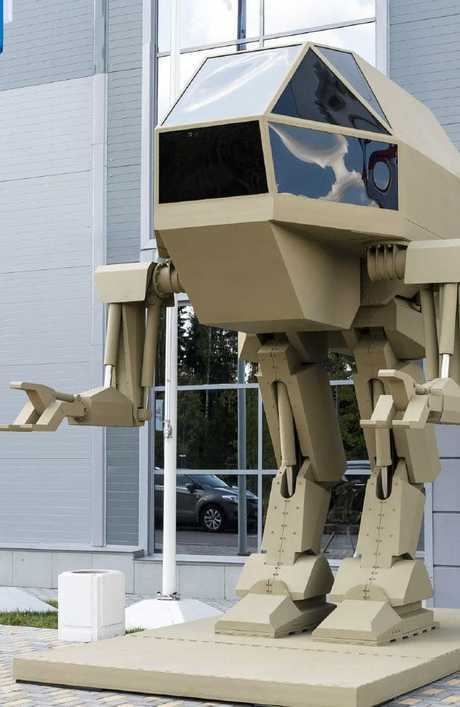 At the moment, the Russian walker has little of the ominous slab-sided appearance of the Star Wars varieties. Nor does it carry the dazzling array of weapons or equipment seen in Battletech. Instead, it looks like a glass egg on legs with relatively small gripping-arms. In fact, the model on display looks like little more than a low-budget movie prop. 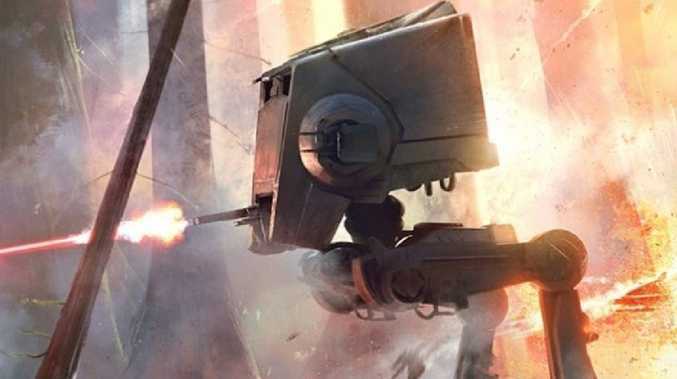 But it demonstrates the potential of turning both the Star Wars AT-ST armoured scout walker and the powered work loader from Aliens into some form of reality. Reality, however, may be a problem. Questions surround the practicality of walking weapons on the battlefield. 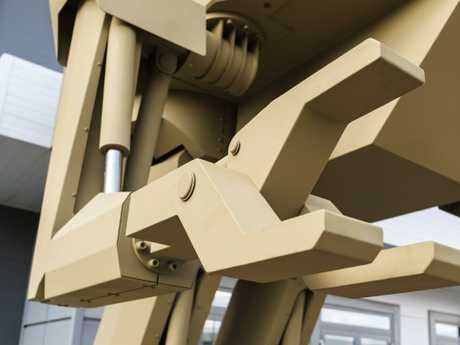 On the surface, the idea of a machine on legs offers some important advantages. It can stride over the debris and hurdles that litter a battlefield. It gives its pilot and sensors a wide-ranging view over the terrain, with its mounted weapons ready to follow. It would be an intimidating sight. SPECIAL FEATURE: Do Star Wars Walkers stand a fighting chance? But, according to military analysts from the Australian Strategic Policy Institute, there are reason's we not seen such machines before. In a lighthearted critique of the new mechanical monsters that appeared in Star Wars: The Last Jedi last year, they said there's the problems of balance, putting a lot of weight on small metal feet - and being an easy target. The harsh reality of the World Wars, Korea, Vietnam, Afghanistan and Iraq have proven mobile troop carriers and scout vehicles must have a low profile to remain unobserved for as long as possible, and fast enough to get in and out of trouble at need. "One of the big disadvantages of legs is that they're inefficient," ASPI's Dr Andrew Davies said. "The only reason that animals don't have wheels is that there's no way to make a bearing that rotates and that has blood vessels passing through it." And, yes, Star Wars: The Empire Strikes Back did highlight the walkers' greatest weakness. "Somehow, 'that armour is too thick for blasters' so we use 'harpoons' to entangle the legs - which raises the key vulnerability of any bipedal or quadrupedal walking machine," says ASPI's Dr Malcolm Davis said. "Take out one leg, the whole thing falls over."